Capacity: The Chalet Lodge sleeps up to 50 guests in 20 rooms. King Rooms: There are ten rooms with king bed arrangements – bed can become two single beds, sleeping one to two guests comfortably. Queen Rooms: There are eight rooms that have a queen bed, plus a single bed, sleeping a maximum of three guests per room. Economy Rooms: There are two rooms with a queen bed and three bunk beds, sleeping a maximum of eight guests per room. Meeting Area: The Chalet meeting area seats up to two hundred guests in very comfortable seating. It is equipped with a fireplace, sound system, screen, projector, piano, and podium. 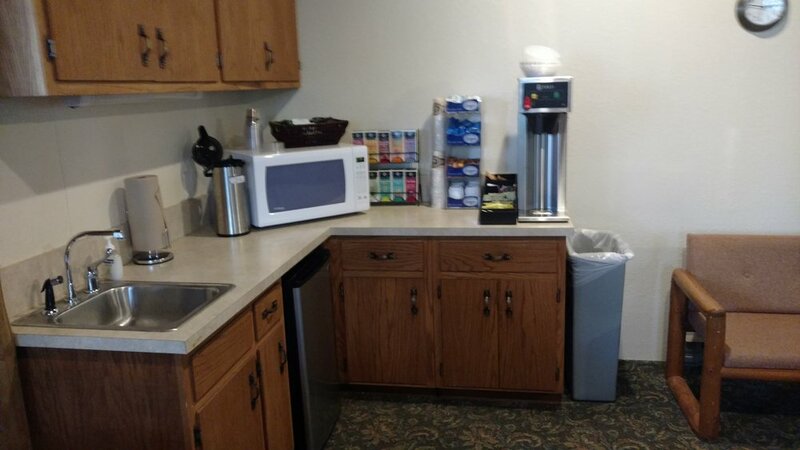 The meeting area also has a coffee bar, refrigerator, and internet access. Lounge: Upstairs is a beautiful lounge or small meeting area with couches, ping pong table and views overlooking the ponds. 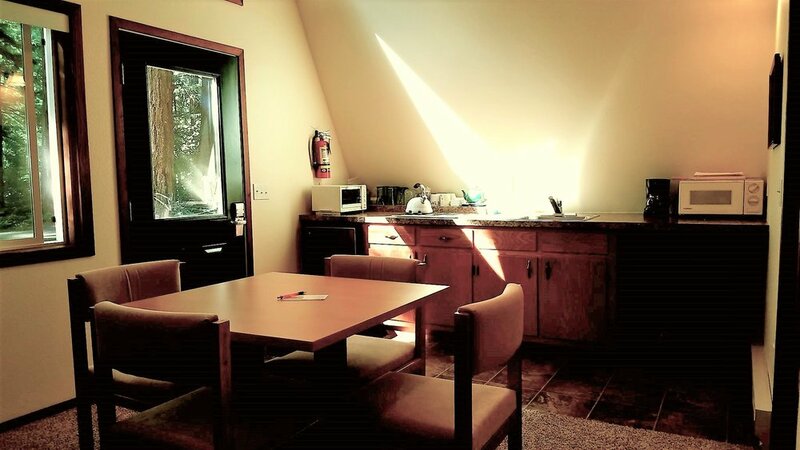 Capacity: The Fireside Lodge sleeps up to 40 guests in 10 rooms. Each room has a queen bed and two single beds--one is a pull out. Each room sleeps a maximum of four guests. Meeting Area: The Fireside meeting area seats up to 50 guests. It is well equipped with a fireplace, coffee bar, piano, refrigerator, free WiFi, small sound system and a video projector. There is also a comfortable lounge area by the fireplace with several couches and chairs. Capacity: The Chapel Lodge sleeps up to 39 guests in 10 rooms. Each room has a queen bed and two single beds--one is a pull out. Each room sleeps a maximum of four guests. Meeting Area: The Chapel meeting area seats up to 30 guests. It is well equipped with WiFi, a fireplace, coffee bar, piano, refrigerator, small sound system and a video projector. 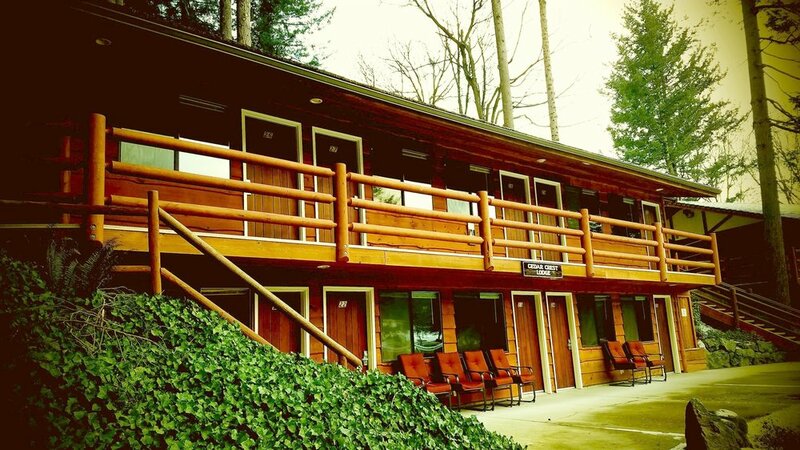 Capacity: Forest Lodge sleeps up to 70 guests in 18 rooms. Sixteen standard rooms have a queen bed and two single beds--one is a pull out. Each standard room sleeps a maximum of four guests. There are also two suites that have a queen bed, a single bed, small kitchenette, and a living room area with a gas fireplace. Each suite sleeps a maximum of three guests. Meeting Area: Forest Lodge is our newest lodge. The meeting area has comfortable seating for 70 guests, Wifi, fireplace, piano, sound system, and coffee bar. Capacity: The Ranch House sleeps up to 20 guests in six rooms. Each bedroom has a combination of queen beds and single beds, plus a bunk bed in one room. Meeting Area: The living room provides a very nice meeting area with a fireplace. The Ranch House also has a fully-equipped kitchen for preparing your own meals, if desired. Capacity: Cabins A and B each sleep a maximum of four guests. Each cabin has one bedroom with a queen bed, plus a loft with two single beds, and one bathroom/washroom with a shower. The lofts have minimal height. Each cabin also has a fully-equipped kitchenette.